I liked the new box, and it would make a superb first impression as a gift. When I first picked up the pen to try it out, my hand was shaking like crazy . I found the pen to write a bit too wet for my taste (more on that later), but it was silky smooth. The pen was truly beautiful, inside and out. 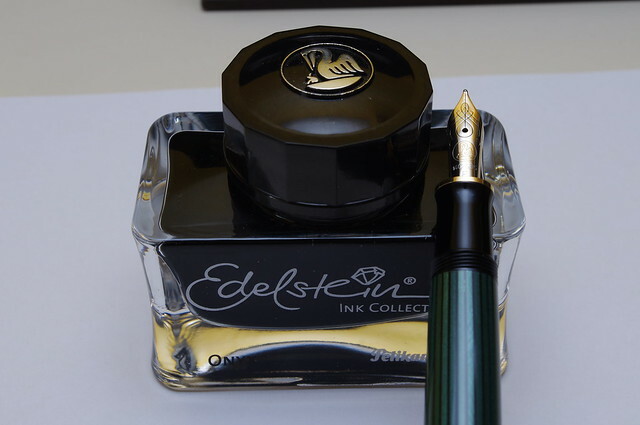 The M600 I bought is black-green, a classic Pelikan color combination. 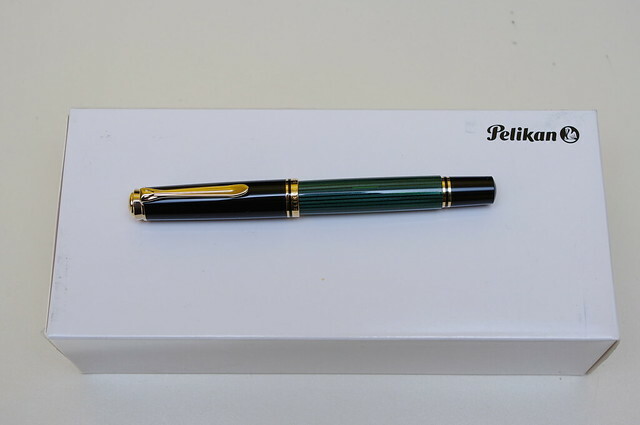 The green-striped body is based on the Pelikan 400 of 1950 and is constructed of cellulose acetate. The green "Stresemann" stripes lend a timeless look to the pen. Add to this the elegant gold-plated trim, including a new metal logo in the gold tassie, and you have a truly beautiful pen. You can't get much more elegant than this. As noted before, the pen is constructed of cellulose acetate. The piston assembly is made of plastic and not brass as in the M800 and M1000, but this is not a problem for me. There are no obvious flaws in the construction of the pen. The body is quite durable and will withstand impacts, but I wouldn't want to abuse it. The pen is of a comfortable medium size and is very easy to handle whether or not the cap is posted. It is lightweight and well balanced. While posting the cap results in a large pen, it is by no means uncomfortable. While this is a very smooth nib, it writes wider and wetter than expected. This can cause bleeding and feathering on various papers, and while less than ideal, this is not a bad characteristic per se. (It will feather on, but not bleed through, Moleskine paper.) 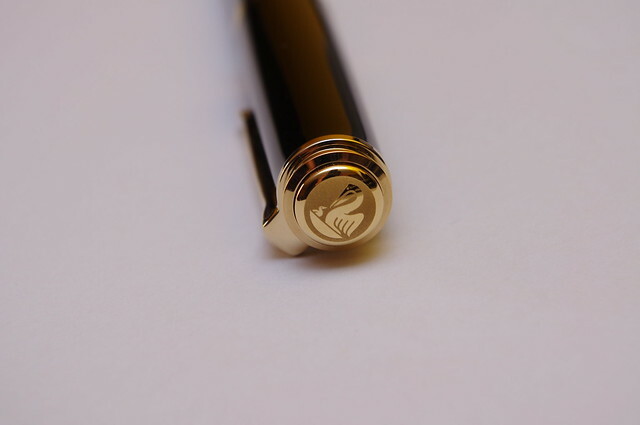 The nib is made of 14K/585 gold with two-tone rhodium plating, inscribed with the Pelikan logo and decorated with scrollwork. I like this design, but as noted before, it is a bit too wet for my taste. The nib is firm, but will spread slightly with moderate pressure. 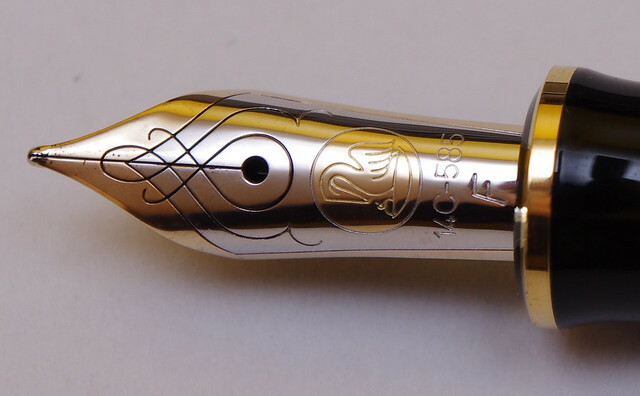 The nib can be easily removed and replaced—a key advantage of Pelikan fountain pens. The M600 uses the tried-and-true differential piston filling system. The system is reliable and offers a relatively high ink capacity. While three passes were needed to initially fill the pen, subsequent fills require only one to two passes. The piston knob rotates smoothly and easily. Based on Pelikan's superb reliability track record, this pen is extremely unlikely to leak or show other serious problems. The pen is very easy to clean because the nib assembly screws out easily; you can let the nib sit in water while rinsing the ink out of the barrel. However, the piston assembly does not screw out like that of the M800 and M1000. This M600 was purchased from Fountain Pen Hospital at US$299. While this is not the best price for the pen, it does carry the assurance that the pen comes from an authorized dealer with the three-year warranty, as well as the opportunity to try it out and get an idea of how it writes before buying. Compared to other pens, this is a good value and is competitively priced compared to other pens. The Pelikan M600 is a superb pen and should be strongly considered for your first-choice pen. There may be better options if you prefer a drier-writing pen, but you should still consider it. I strongly recommend it to anyone who wants a elegant, reliable pen with a wet, smooth nib. Edited by DragonLord, 16 November 2011 - 02:03. Beautiful pen. Thanks for sharing! Beautiful. What inks did you try? Beautiful pictures of a magnificent pen. Pelikans (specially M400, M600, M800, ...) generally write wet and drier inks would work much better. I found that Pelikan (not the modern Edelstein which I have not tried yet) and MB inks are very adequate. No wonder why these brands make inks that fit their pens. I tend to only use MB inks in my modern Pelikans. Thank you DragonLord for an excellent review! I have the exact same M600 and I agree with your review completely. It's a gorgeous pen, and although it does write wetter than I expected, the Pelikan 4001 inks dry very fast so I haven't had too much difficulty. And you can always get the nib tuned to your liking if it's really too wet for you. I used Edelstein Onyx in my M600. I have not had a chance to try 4001 Brilliant Black. To be honest, I don't like changing inks often, since each ink change requires a thorough cleaning of the pen, and any residual ink can result in contamination of the ink bottle with other inks. I prefer to choose an ink and stick with it for as long as possible. Edited by DragonLord, 16 November 2011 - 21:01. A classic pen and a good choice by the way. I hope you will enjoy it for a long time. Just bought myself an M600 while away for a conference (no pen shops at home). Already have (and love) an M605, the all-blue one with silver trim, but decided to try a classic striped one. I find that each nib is a bit different coming out of the box; my M605 was fairly wet, but the new M600 I bought was quite dry. I find that I pretty much expect to do a little adjusting on even my most expensive pens to ake it just right 'for me'. A touch of adjusting on the new M600, and it is another perfect writer! By the way, has anyone read this Pelikan press release? The major functional reasons that Pelikan M600 and M400 are chosen are 1) smooth writing, 2) good balance, 3) easy to hold, 4) soft and Flexible nib, 5) various nib widths are available and 6) M400 is the perfect size for female writers. 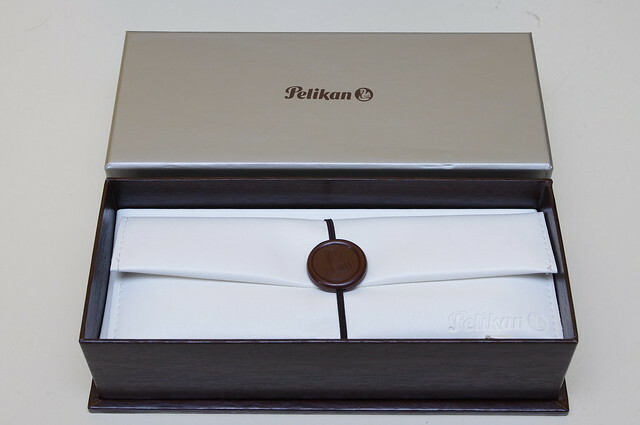 Of course, the design and the typical Pelikan strives are highly appreciated. Another testament to the reliability and performance of Pelikan writing instruments. My dad bought me this pen in the early 90's, I really enjoy it. The only ink I've used in it is Pelikan ink from the mid 20th century and find it not so wet unless the paper is lesser quality. It seems to have held it's value. I love the logo on the nib and the cap. Nice Pen. Thanks for the review. a beautiful Pelikan ! Too many pens; too little writing. Really nice pen, hope you enjoy it. Great acquisition! But 9,0 for this Filling System?!?! I disagree!! That one is 10! Pelikan piston fillers are awesome, the best out there! Truly the Gold Standard! The filling system score also includes maintenance. The reason it does not get a 10 is that the piston assembly is not user serviceable because it does not screw out like on the M800 and M1000. If this was the case, I would have given it a 10. But why would you even want to take the Pelikan piston system apart for maintenance? You are assuming they have to be serviced regularly or they will seize or something. I would think the piston systems in the vintage Pelikans go decades without ever needing servicing if at all. Edited by max dog, 18 January 2012 - 05:35. The most common reason to do so is lubrication and cleaning of the piston should it fail to move freely, which is very unlikely to occur if the pen is cleaned out on a regular basis. A properly maintained piston-filled pen should not require disassembling the piston unit, but it would make it easier to service the piston in case of a problem.